"OUR SCHOOL'S GOT TALENT 2010-11"
The project is designed to both broaden the awareness of the work of Special Olympics and also generate much needed funds for our charity. Mayor of Sligo Matt Lyons and Special Olympics CEO Mat English launch Ourschoolsgottalent contest a fundraiser for Special Olympics Connacht. The competition will be open to all secondary school students in Connacht and carries a total prize fund of €20,000. Each county will have its own individual competition with a prize fund of €3,000 with eight contestants from each county progressing to the provincial knock out stages. The Connacht final will be held in the prestigious Royal Theatre Castlebar on March 16th. 2011. Mayo gets proceedings underway with heats during the month of October in Ballina, Castlebar and Claremorris. If you are a secondary school student in Mayo and can sing, dance, juggle, are in a band or can make people laugh, this is the competition for you. Co-ordinator Breda Rabbitte on osgt@live.com or your school principal. To all Host Town Volunteers………Gracias! 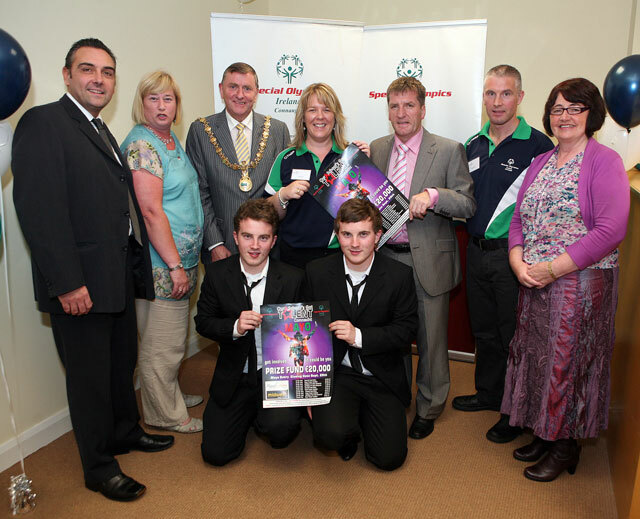 Castlebar welcomes The Venezuelan Special Olympic Delegation-Bienvenidos! Share the feeling……….Sing the feeling!